Expositionsgrenzwerte :TLV-TWA 1 ppm (～1.5 mg/m3) (ACGIH), MSHA,andOSHA),IDLH75 ppm(NIOSH). Stabilität: :Slightly unstable - will very slowly decompose. Decomposition is promoted by catalysts and heating, so store cool. Light sensitive, keep in the dark. May contain stabilizer. Reacts with rust, brass, zinc, nickel, finely powdered metals, copper and iron and their alloys. Chemische Eigenschaften Colorless liquid; pure compound or 90% solution unstable; bitter taste; density 1.463 g/mL; boils at 150.2°C; freezes at –0.43°C; vapor pressure 9.9 torr at 50°C and 121.5 torr at 100°C; viscosity 1.245 centipoise at 20°C; surface tension 80.4 dyn/cm at 20°C; miscible with water in all proportions; soluble in ether; densities of 30%, 70%, and 90% H2O2 solutions are 1.1081, 1.2839 and 1.3867 g/mL, respectively, at 25°C; freezing points at these concentrations are –25.7°C, –40.3°C and –11.5°C, respectively; and their boiling points are 106.2°C, 125.5°C and 141.3°C, respectively; decomposed by many organic solvents; pKa at 25°C is 11.62. History Hydrogen peroxide was prepared first by Thenard in 1818. It has many industrial applications. Aqueous solutions at varying concentrations are used for bleaching fabrics, silks, furs, feathers and hair; as a dough conditioner; and a bleaching and oxidizing agent in foods; for cleaning metals; as a laboratory reagent for oxidation; as an antiseptic; in sewage and wastewater treatment; and in preparation of inorganic and organic peroxides. An 80% concentrated solution is used in rocket propulsion. Verwenden hydrogen peroxide is a bleaching and oxidizing agent, detergent, and antiseptic. It is generally recognized as a safe preservative, germ killer, and skin bleacher in cosmetics. If used undiluted, it can cause burns of the skin and mucous membranes. Verwenden Hydrogen peroxide is used for bleaching silk, fabrics, feathers, and hairs; in refining oils and fats; for cleaning metals surfaces; as an antiseptic; and in rocket propulsion (90% solution). It is marketed as an aqueous solution of 3-90% by weight. Verwenden Synthesized hydrogen peroxide is approximately 60% H2O2 by weight and is distilled tohigher concentrations and diluted to lower concentrations for intended purposes. Differentgrades of hydrogen peroxide are sold that contain stabilizers and additives dependent on theend use. Food grade hydrogen peroxide comes in 35% and 50% concentrations. It is usedfor disinfecting purposes and also as an ingredient in cosmetics, shampoos, and medications.Reagent hydrogen peroxide for chemical and medical laboratories has a concentration of 30%.Standard grades of 35%, 50%, 60%, and 70% are used for industrial bleaching. Generalhousehold hydrogen peroxide is 3% H2O2 and 6% is used by beauticians for hair coloring.Very high grades such as 90% are used as oxidizers in rocket propulsion. Hydrogen peroxide has a number of environmental uses. Hydrogen peroxide has a number of environmental uses. These include water treatment, odorcontrol, oxidation of pollutants, and corrosion control. Hydrogen peroxide is used to removeiron, manganese, and hydrogen sulfide from water supplies and wastewater. The oxidation ofsubstances such as hydrogen sulfide reduces odors. Because H2O2 decomposes into oxygen andwater, it has the added advantage of lowering the biological oxygen demand of wastewater.ese include water treatment, odorcontrol, oxidation of pollutants, and corrosion control. Hydrogen peroxide is used to removeiron, manganese, and hydrogen sulfide from water supplies and wastewater. The oxidation ofsubstances such as hydrogen sulfide reduces odors. Because H2O2 decomposes into oxygen andwater, it has the added advantage of lowering the biological oxygen demand of wastewater. Hydrogen peroxide is used in chemical synthesis and can function as both an oxidizing andreducing agent. Caro’s acid (H2SO5) is made using H2O2. Peracetic acid (C2H4O3) is producedby reacting acetic acid and hydrogen peroxide and is used as a disinfectant. Solid bleachingagents such as perborates and percarbonates are made using H2O2. It is used in epoxida tionand hydroxylation reactions. Epoxidation reactions involve the breaking of double bondsin alkenes, with the carbons then bonding to the same oxygen atom to form an epoxide ring. Vorbereitung Methode From 1920 to 1950, the primary method of production was electrolysis. One process involved passing electric current through sulfuric acid to produce the peroxydisulfate ion (S2O8 2-), which was then hydrolyzed to H2O2: 2H2O + S2O82- (aq) 2H2SO4-(aq) + H2O2(aq).the relatively high cost of electricity of this method encouraged a search for a more economical production process. Hydrogen peroxide is currently produced on a large scale using the anthraquinone autooxidation procedure, which was developed in the 1940s. 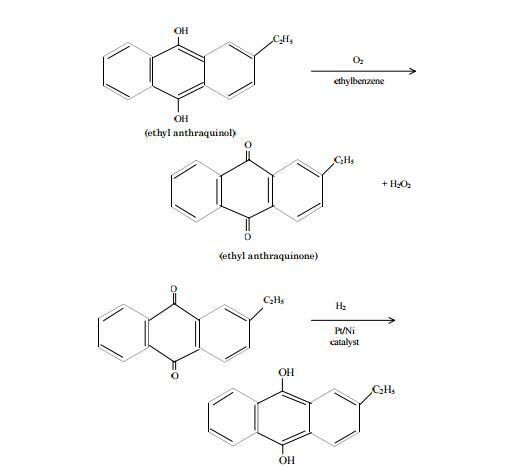 In this process, an anthraquinone, typically 2-ethyl-anthraquinone, is hydrogenated to a hydroquinone (2-ethyl-anthrahydroquinone) then reoxidized back to the anthraquinone (2-ethyl-anthraquinone) while forming hydrogen peroxide . A metal palladium or nickel catalyst is used to convert the anthraquinone to the hydroquinone, followed by autooxidation in air to generate hydrogen peroxide. The anthraquinone and hydrogen peroxide are separated; the former is recycled to repeat the process while the hydrogen peroxide is purified. Definition hydrogen peroxide: A colourlessor pale blue viscous unstable liquid,H2O2; r.d. 1.44; m.p. –0.41°C; b.p.150.2°C. As with water, there is considerablehydrogen bonding in theliquid, which has a high dielectricconstant. It can be made in the laboratoryby adding dilute acid to bariumperoxide at 0°C. Large quantitiesare made commercially by electrolysisof KHSO4.H2SO4 solutions. Anotherindustrial process involvescatalytic oxidation (using nickel, palladium,or platinum with an anthraquinone)of hydrogen and waterin the presence of oxygen. Hydrogenperoxide readily decomposes in lightor in the presence of metal ions togive water and oxygen. It is usuallysupplied in solutions designated byvolume strength. For example, 20-volume hydrogen peroxide wouldyield 20 volumes of oxygen per volumeof solution. Although the peroxidesare formally salts of H2O2, thecompound is essentially neutral.Thus, the acidity constant of the ionizationH2O2 + H2O ?H3O+ + HO2–is 1.5 × 10-12 mol dm-3. It is a strongoxidizing agent, hence its use as amild antiseptic and as a bleachingagent for cloth, hair, etc. It has alsobeen used as an oxidant in rocketfuels. Definition ChEBI: An inorganic peroxide consisting of two hydroxy groups joined by a covalent oxygen-oxygen single bond. Hydrogen peroxide may also be made by heating 2-propanol with oxygen at 100°C under 10 to 20 atm pressure: (CH3)2CHOH (CH3)2C(OH)OOH → CH3COCH3 + H2O2 Vapor phase partial oxidation of hydrocarbons also yield H2O2. However, several by-products are generated, the separations of which make the process difficult and uneconomical. and concentrated by fractional distillation at reduced pressures. CHEMISCHE GEFAHREN Zersetzung beim Erwärmen oder unter Einfluss von Licht unter Bildung von Sauerstoff. Erhöhte Feuergefahr. Starkes Oxidationsmittel. Reagiert sehr heftig mit brennbaren und reduzierenden Stoffen unter Feuer- und Explosionsgefahr, besonders in Gegenwart von Metallen. Greift viele organischen Materialien an, z.B. Textilien und Papier. ARBEITSPLATZGRENZWERTE TLV: 1 ppm (als TWA) Krebskategorie A3 (bestätigte krebserzeugende Wirkung beim Tier mit unbekannter Bedeutung für den Menschen); (ACGIH 2005). MAK: 0,5 ppm 0,71 mg/m? Spitzenbegrenzung: überschreitungsfaktor I(1); Krebserzeugend Kategorie 4; Schwangerschaft: Gruppe C; (DFG 2005). AUFNAHMEWEGE Aufnahme in den Körper durch Inhalation der Dämpfe und durch Verschlucken. INHALATIONSGEFAHREN Beim Verdampfen bei 20°C kann schnell eine gesundheitsschädliche Kontamination der Luft eintreten. Die Substanz verätzt die Augen und die Haut. Der Dampf reizt die Atemwege. IBeim Verschlucken können sich Sauerstoffblasen im Blut (Embolie) mit nachfolgendem Schock bilden. WIRKUNGEN NACH WIEDERHOLTER ODER LANGZEITEXPOSITION Risiko der Lungenschädigung bei Inhalation hoher Konzentrationen. Möglich sind Auswirkungen auf die Haare (Bleichwirkung). LECKAGE Belüftung. Verschüttete Flüssigkeit mit viel Wasser wegspülen. NICHT mit Sägemehl oder anderen brennbaren Absorptionsmitteln binden. NICHT in die Umwelt gelangen lassen. Persönliche Schutzausrüstung: Chemikalienschutzanzug mit umgebungsluftunabhängigem Atemschutzgerät. Allgemeine Beschreibung A colorless liquid dissolved in water. Vapors may irritate the eyes and mucous membranes. May violently decompose on contact with most common metals and their compounds. Contact with combustible material may result in spontaneous ignition. Corrosive to tissue. Under exposure to fire or heat containers may violently rupture due to decomposition. Used to bleach textiles and wood pulp, in chemical manufacturing, food processing, and in water purification. R20/22:Gesundheitsschädlich beim Einatmen und Verschlucken. R8:Feuergefahr bei Berührung mit brennbaren Stoffen. Air & Water Reaktionen Water soluble. Reaktivität anzeigen The hazards associated with the use of HYDROGEN PEROXIDE(especially highly concentrated solutions) are well documented. There is a release of enough energy during the catalytic decomposition of 65% peroxide to evaporate all water and ignite nearby combustible materials. Most cellulose materials contain enough catalyst to cause spontaneous ignition with 90% peroxide. Contamination of concentrated peroxide causes the possibility of explosion. Readily oxidizable materials, or alkaline substances containing heavy metals may react violently. Solvents(acetone, ethanol, glycerol) will detonate on mixture with peroxide of over 30% concentration, the violence increasing with concentration. Concentrated peroxide may decompose violently in contact with iron, copper, chromium, and most other metals or their salts, and dust(which frequently contain rust). During concentration under vacuum of aqueous or of aqueous-alcoholic solutions of hydrogen peroxide, violent explosions occurred when the concentration was sufficiently high(>90%), [Bretherick 2nd ed., 1979]. Hydrogen selenide and hydrogen peroxide undergo a very rapid decomposition, [Mellor 1:941(1946-1947)]. Hazard Hydrogen peroxide is a strong oxidizing agent. Concentrated solutions, even a 30% aqueous solution, should be handled carefully. The compound decomposes violently in the presence of trace impurities. Inhibitors are, therefore, added at trace levels to prevent decomposition. Explosion can occur when concentrated solutions are heated or brought in contact with a number of organic substances that are readily oxidizable or that form organic peroxides, such as alcohols, aldehydes, ketones, anhydrides, and carboxylic acids (Patnaik, P. 1999. A Comprehensive Guide to the Hazardous Properties of Chemical Substances, 2nd ed. New York: John Wiley & Sons). Also, reactions with metals, metal alloys, a number of metal salts and oxides, and concentrated mineral acids can proceed to explosive violence. Health Hazard Concentrated solutions of hydrogen peroxide are very caustic and can cause burns of skin and mucous membranes. Exposure to its vapors can produce body irritation, lacrimation, sneezing, and bleaching of hair. A dose of 500 mg/kg by dermal route caused convulsions and deaths in rabbits. The oral LD50 value for 90% peroxide solution in mice is 2000 mg/kg. Oral administration of hydrogen peroxide produced tumors in gastrointestinal tract in mice. There is limited evidence of carcinogenicity in animals. Cancercausing effects of hydrogen peroxide in humans are unknown. Padma and coworkers (1989) reported the promoting effect of hydrogen peroxide on tobacco-specific Nnitrosoamines in inducing tumors in the lung, liver, stomach, and cheek pouch in Syrian golden hamsters and mice. The incidence of cheek pouch tumors increased when peroxide was administered concurrently or applied for a long period after a low initiator dose of N-nitrosamines. .
Health Hazard TOXIC; inhalation, ingestion or contact (skin, eyes) with vapors, dusts or substance may cause severe injury, burns or death. Fire may produce irritating and/or toxic gases. Toxic fumes or dust may accumulate in confined areas (basement, tanks, hopper/tank cars, etc.). Runoff from fire control or dilution water may cause pollution. Brandgefahr May explode from friction, heat or contamination. These substances will accelerate burning when involved in a fire. May ignite combustibles (wood, paper, oil, clothing, etc.). Some will react explosively with hydrocarbons (fuels). Containers may explode when heated. Runoff may create fire or explosion hazard. Aussehen Eigenschaften H2O2, Perhydrol 35 %ig in Wasser. In hohen Konzentrationen Giftwirkung auf Fische u. Plankton, 40 mg/l giftig für Forellen. Störungsschwelle f. Fischnährtiere ab 2500 mg/l, Fischtoxizität (goldorfe) LC50(48h): 35 mg/l (H2O2 100%). in Erdreich u. Wasser erfolgt schnelle Reduktion oder Zersetzung zu reinem Wasser u. Sauerstoff. Im allgemeinen nicht wassergefährdend. Schutzmaßnahmen und Verhaltensregeln Dicht verschlossen, an gut belüftetem Ort, kühl (unter 15鳦), unter Lichtschutz lagern.Verunreinigungen fernhalten. Nur Behälter mit Überdrucksicherung verwenden! Kontakt-Allergie Hydrogen peroxide is an oxidizing agent used as a topi- cal antiseptic, and as part of permanent hair-dyes and color-removing preparations, and as a neutralizing agent in permanent waving. The concentration of the hydrogen peroxyde solution is expressed in volume or percentage: Ten volumes correspond to 3%. It is an irritant. Verhalten im Gefahrfall Mit flüssigkeitsbindendem Material (z.B. Vermikulite) aufnehmen, Entsorgung zuführen, Reste mit viel Wasser wegspülen. Nach Augenkontakt: 15 Minuten bei gespreizten Lidern unter fließendem Wasser mit Augendusche ausspülen. Augenarzt konsultieren! Nach Einatmen: Frischluft, Arzt hinzuziehen. Nach Verschlucken: Viel Wasser/Milch trinken, Erbrechen möglichst vermeiden. Arzt konsultieren. Nach Kleidungskontakt: Getränkte Kleidung sofort ausziehen, ggf. auch die Unterwäsche. Toxikologie Hydrogen peroxide is used as an agent to reduce the number of bacteria in dairy products or other foodstuffs. In the dairy industry, hydrogen peroxide also has been used as a substitute for heat pasteurization in the treatment of milk and as a direct preservative in keeping the quality of the milk. In Japan, it has been used as a preservative for fish-paste products. Hydrogen peroxide also has a bleaching effect. The use of highly pure hydrogen peroxide in manufactured cheese has been approved by the United States Food and Drug Administration (industrial grade hydrogen peroxide is usually a 3–35% aqueous solution; a commercial home product is a 3% aqueous solution). Acute toxicities (LD50) of hydrogen peroxide for rats are 700 mg/kg/b.w. and 21 mg/kg/b.w. by subcutaneous injection and intravenous injection, respectively. When large amounts of hydrogen peroxide were injected directly into the stomachs of rats, weight and blood protein concentrations were changed slightly. When hydrogen peroxide was mixed with feed, however, no abnormalities were observed. The use of bactericides has been limited due to their toxicity to humans, and only hydrogen peroxide currently is recognized for use. Lager Use extreme care when carrying out reactions with hydrogen peroxide because of the fire and explosion potential (immediate or delayed). The use of safety shields is advisable, and is essential for experiments involving concentrated (>50%) solutions of hydrogen peroxide. Sealed containers of hydrogen peroxide can build up dangerous pressures of oxygen, owing to slow decomposition. läuterung methode The 30% material has been steam distilled using distilled water. Gross and Taylor [J Am Chem Soc 72 2075 1950] made 90% H2O2 approximately 0.001M in NaOH and then distilled it under its own vapour pressure, keeping the temperature below 40o, the receiver being cooled with a Dry-ice/isopropyl alcohol slush. The 98% material has been rendered anhydrous by repeated fractional crystallisation in all-quartz vessels. EXPLOSIVE IN CONTACT WITH ORGANIC MATERIAL. Inkompatibilitäten Contact with many organic compounds can lead to immediate fires or violent explosions (consult Bretherick for references and examples). Hydrogen peroxide reacts with certain organic functional groups (ethers, acetals, etc.) to form peroxides, which may explode upon concentration. Reaction with acetone generates explosive cyclic dimeric and trimeric peroxides. Explosions may also occur on exposure of hydrogen peroxide to metals such as sodium, potassium, magnesium, copper, iron, and nickel. Flammability and Explosibility Hydrogen peroxide is not flammable, but concentrated solutions may undergo violent decomposition in the presence of trace impurities or upon heating. Waste disposal Excess hydrogen peroxide and waste material containing this substance should be placed in an appropriate container, clearly labeled, and handled according to your institution's waste disposal guidelines. For more information on disposal procedures, see Chapter 7 of this volume. Wasserstoffperoxid Anbieter Lieferant Produzent Hersteller Vertrieb Händler. Firmenname：Jiaxing Deyi Chemical Co., Ltd.
HYDROGEN PEROXIDE 30%, ACS, NOT STAB. HYDROGEN PEROXIDE 30% ACS STAB.